The following is a guest post by John Hall. 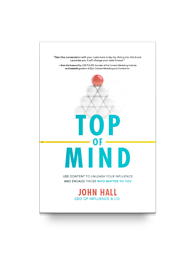 John Hall (@johnhall) is the CEO of Influence & Co., a keynote speaker, and the author of "Top of Mind." You can book John to speak here. If I asked you to close your eyes and picture the two people you trust most in the whole world, who would you see? I see my wife and my mother. Years of offering wise counsel, challenging me to grow, and teaching me something new have fostered an incredible bond of trust and respect between us. Your two most-trusted people might be friends, colleagues or mentors. Whoever they are, I’m guessing there was no flash of brilliance that made you think, “Yeah, I trust this person!” Trust doesn't happen in a flash. Instead, these people earned your confidence over time by consistently providing value to you. Now, I'm not saying you'll ever be able to usurp someone's mom or spouse in the trust department, but you can cultivate trust in the same ways. Delivering engaging, high-quality content that offers value on a regular basis helps you build industry influence and assure people that you're a voice worth listening to. Do that long and often enough, and you’ll become a go-to resource in your field. You can create opportunity for your company by building trust with your audience—but that trust only emerges after you’ve proven that you’re worthy of it. From a marketing standpoint, you do that through content. When you meet people’s needs through your content on a regular basis, they'll come to trust you. But as much success as I've seen through content, published work can really only help you scale trust by reaching more people. You've got to be a trustworthy person for that content to make much of a difference. In my new book, "Top of Mind," I explain ways you can earn the trust of the audiences that matter most to you. For a crash course to get you started, here are three must-follow strategies for building trust and creating opportunity. Business leaders are often so busy trying to prove their worth that they don’t even realize they come off as self-centered and arrogant—the opposite of authentic thought leadership. Early in my career, I felt like I had to impress people with my accomplishments in order for them to take me seriously. I wasn’t trying to be a jerk; I genuinely believed that I had to market myself this way to get ahead. 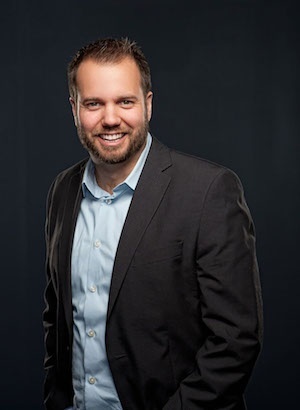 But over time, I realized that wasn't the way to get people to trust me, and an article by Jeff Jones (@jjones), "The Truth Hurts," really drove that idea home for me. His article about Target’s data breach helped me realize that honesty and candor are far more effective than bragging to impress people. Trust comes from human connection, and people can’t connect with you if all you talk about is how great you are. 2. Become a likable person. If you want your audience to trust you, read your content, and eventually buy from you, you've got to get them to like you. Sure, no one of thinks of him- or herself as unlikeable, but there’s always work we can do in this department. I thought of myself as a likable, friendly guy (I did grow up in the Midwest, after all) until an article by Jeff Haden (@jeff_haden), “How to Be Exceptionally Likable: 11 Things the Most Charming People Always Do,” inspired me to focus more on helping other people and listening to their stories than sharing my own. When you emphasize others’ needs and make efforts to genuinely connect, you demonstrate likability and build stronger, more reciprocal relationships, which can lead to opportunity in the future. 3. Build a likable brand. It’s not enough for the CEO or executive team to be charming. Your company brand doesn't rely only on that one charming group; it relies on the entire team. 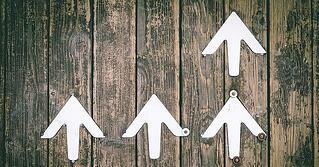 Your company should be filled with engaging, helpful, likable people. Every person is a potential thought leader capable of contributing insightful content. The more you can integrate authenticity and authority throughout the organization, the more cohesive your brand experience will be—and the more likely people are to trust it. If you want to grow your company, you must establish trust and deliver value on a consistent basis; your formula for creating opportunity only works when you've got both of these elements in place. Check out a free chapter preview of "Top of Mind" for more ways to start building better relationships and engaging your audience.